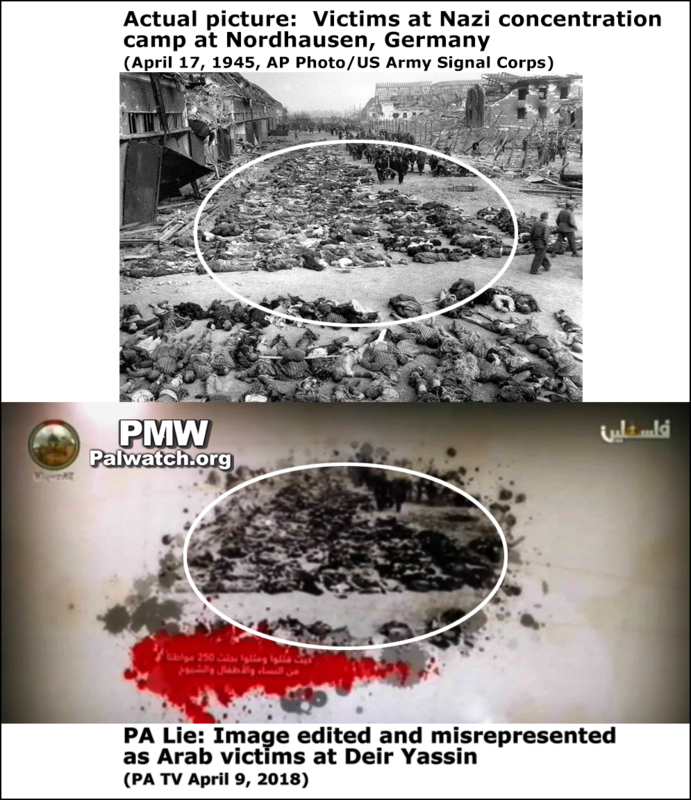 PA TV lie #1: PA TV distorted a photo of victims murdered in a concentration camp. PA erased the images of corpses in striped concentration camp uniforms; erased images of the American soldiers who had liberated the camp; erased images of the concentration camp buildings; and presented photo of the remaining dead bodies as Arab victims of Jews in 1948. "And they [the Jews] burned the women and children in the village's oven"
Just days before Israel's Holocaust Memorial Day, Palestinian Authority Holocaust abuse and exploitation has reached a new low. 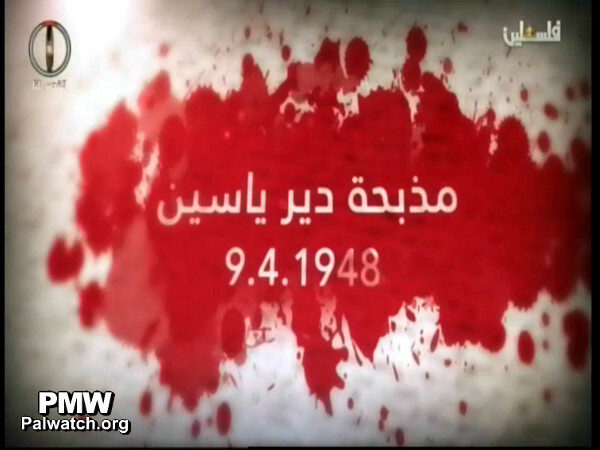 PA TV misappropriated a photo showing hundreds of dead bodies at the Nazi concentration camp at Nordhausen, originally a subcamp of Buchenwald, presenting them as Arabs killed by Jews on April 9, 1948 in the Arab village of Deir Yassin. 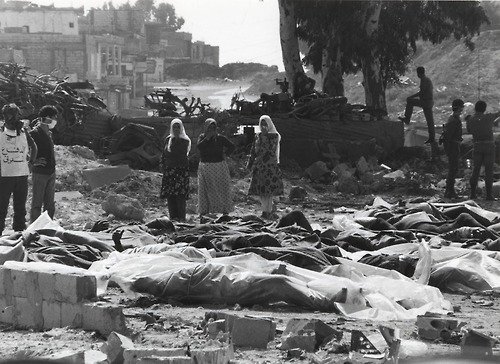 The PA TV video, which was broadcast this week on the anniversary of the Deir Yassin battle, also included a photo (right) of victims of the massacre at the 1982 Sabra and Shatila refugee camp by Christian Lebanese, which was likewise misrepresented as showing Arabs who were killed by Jews. 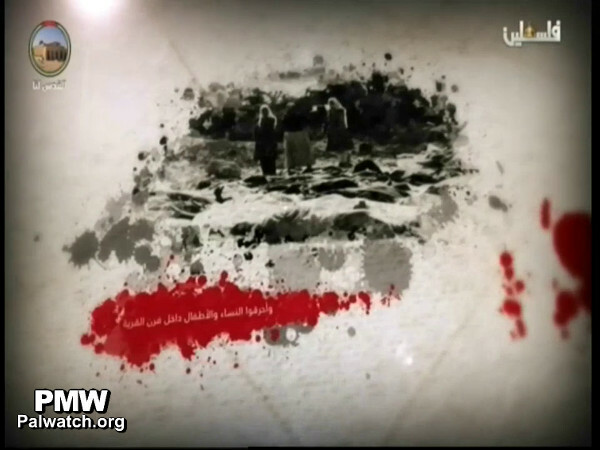 PA TV broadcast this picture (below right) which is distorted from its original, erasing the soldiers and buildings on the sides and leaving the images of the bodies. The third lie in the PA TV video, was the following text printed on the screen under the photo: "And they [the Jews] burned the women and children in the village's oven." Whereas, Arab civilians were killed at Deir Yassin during the battle, it is a complete historical distortion to claim that Jewish fighters "burned the women and children in ovens." Jewish fighters from the Irgun and Lehi military groups, part of the forces opening the blockaded road to Jerusalem, attacked the Arab village of Deir Yassin on April 9, 1948. When the battle was over, the village had fallen and in addition to the Arab fighters killed, 107 civilians were also killed. Narratives differ as to whether the civilians were killed in the crossfires or were intentionally murdered by the Irgun and Lehi fighters.